The plastic bag is a ubiquitous symbol of pollution globally. Along highways, in storm drains, canals, creeks and the Hudson River single-use plastic bags are everywhere. 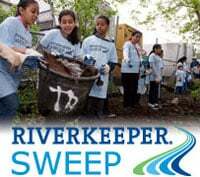 Each year in the Riverkeeper Sweep we empower communities to reclaim their waterways. 2014 marked the largest cleanup on the Hudson yet—1,900 volunteers in 82 locations removing 31 tons of pollution—a feat that makes Riverkeeper proud. 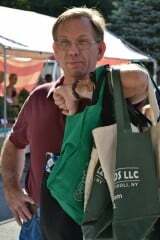 In August, Riverkeeper with Down to Earth Markets, Green Ossining and ECOBAGS® forged the BYOBag coalition. The goal of the coalition was to dramatically reduce the amount of single-use plastic bags consumed at the Ossining Farmers Market. The staff at Down to Earth Markets estimated that annually the Ossining Market distributed over 64,000 single-use plastic bags passed from vendors to shoppers. Initial results of the BYOBag pilot program place a 60-70% reduction in single-use plastic bags. The goal for the market was broken down into two objectives: encourage reusable bag use by shoppers and engage market vendors to adopt a 10-cent fee for single-use plastic bags by September 27. The Ossining Farmers Market hosts between 600-800 shoppers per weekend and features over a dozen vendors. Any strategy developed had to balance the goal of reducing plastic bags and maintaining sales volume for the vendors. In meeting the first objective the coalition adopted a strategy of education and positive reinforcement. Riverkeeper volunteers and Green Ossining made public service announcements, greeted shoppers at entrances and thanked those who brought reusables. To reach their customers, Down to Earth Markets distributed bilingual flyers, posters, e-newsletters and utilized social media. The multifaceted communication effort was a crucial component of success, allowing the coalition to reach a broad range of market-goers in the six-week launch period. The second objective was met through two important methods. First, Down to Earth Markets initiated a dialogue with their vendors inviting their participation and addressed concerns as the program moved forward. Secondly, ECOBAGS® donated approximately a thousand reusable bags to provide shoppers with a free alternative in the weeks leading up to the launch. Community members also donated their excess reusable bags in a great showing of community spirit. 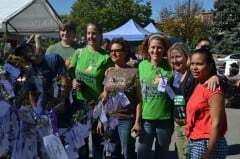 In addition, Green Ossining volunteers from Ossining High School taught shoppers how to make reusable bags out of t-shirts donated to the market. By September 27 most vendors fully embraced the program and moved their single-use plastic bags behind the counter. The coalition also encouraged shoppers to sign a pledge to remember their reusable bags at future markets. 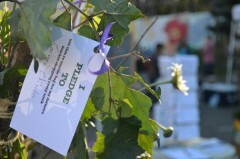 Over 300 pledges were made and tied to a community pledge tree that will be featured at the market. Single-use plastic bag use in the market immediately declined as shoppers made the pledge and adapted to the new policy. Over the past few weeks vendors have adjusted, adding reusable shopping baskets and selling custom reusable bags at their stalls. Not surprisingly, the response to the program has been overwhelmingly positive by the Ossining community. The positive response by the community leads us to believe that policies to reduce plastic bags are ripe for passage across the Hudson Valley from farmers markets to town halls. Indeed, California recently became the first state to enact a state-wide ban on single-use plastic bags in grocery stores and convenience stores. Closer to home, the New York City council is taking up legislation that would enact a 10-cent fee on single-use plastic bags. The Ossining Farmers Market certainly isn’t California or New York City. However, in raising awareness of plastic pollution for a few thousand shoppers in Westchester County, this coalition has learned valuable lessons about building successful community driven campaigns to reduce solid-waste pollution. First and foremost education is crucial; people must be aware of the policy, need to understand the reason(s) for the policy change and must be offered reasonable alternatives. Secondly, diverse coalitions including businesses, non-profits and community organizations are fundamental in driving solutions, because a range of voices and opinions legitimizes and strengthens action. On October 21, the coalition presented the initial results of the BYOBag program at the request of the Ossining town board. The board has requested to review sample legislation from several towns in Westchester County with single-use plastic bag reduction policies in place. In our eyes, simply starting the conversation in government is a sign of success and progress. We are excited and eager to support the town with any questions or support necessary when reviewing options for Ossining. With valuable lessons in mind, the BYOBag coalition plans to further our progress at the Ossining Farmers Market heading into the winter. 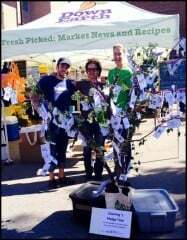 Riverkeeper is grateful for the opportunity to engage in this community effort with Down to Earth Markets, Green Ossining and ECOBAGS®. For tips on keeping your reusable bag clean please visit this post at foodsafety.gov.